I got mine on Christmas Eve. Before I even put batteries in I took off the front plate and fixed the ribbon! I'm glad I did too. At least now I can enjoy my baby without any thoughts about having problems with it! I got mine fixed, I bent an inward U into the ribbon on the newer screen Evolv sent me. But I also dismantled the entire mod and used lower gauge, thicker silver wiring because it was to my understanding that the stock wires were barely good enough to get the job done. I also grounded it better. I really like this mod. I love the DNA200, I like the battery life I can get out of three 18650's without having to shove some big 3,200mah 3S lipo into a box, the 510 is strong and conductive, easy to remove battery door, responsive buttons. But with the screen at risk and the wires undersized, that's a big no. Not everyone has the stones to tear apart their mod to fix it like I did and some others have, so I really hope Wismec gets these three things done. I already have a Reuleaux that's like this, and I'll say, it's more efficient on the batteries and I don't have to worry about random failure as much. I dig it. To anyone who has a Reuleaux, some 14-16awg wire, and some 22-24awg wire with a soldering iron/solder, I recommend replacing the battery sled connection wires and the 510 wires, then the balance wires. Also, tighten that ground screw securely, I completely took it out and grounded it to solid metal, but, to each their own. I have done this, as my devices cable WAS rubbing against the fire button when pressed. I added the S bend, but after, as you can see on page 1, the screen was not level, touching the front panel at the top, but had a hole in the bottom that juice could easily get in. So, I took it apart again, and after some careful repositioning, have the screen flush against the outer housing. 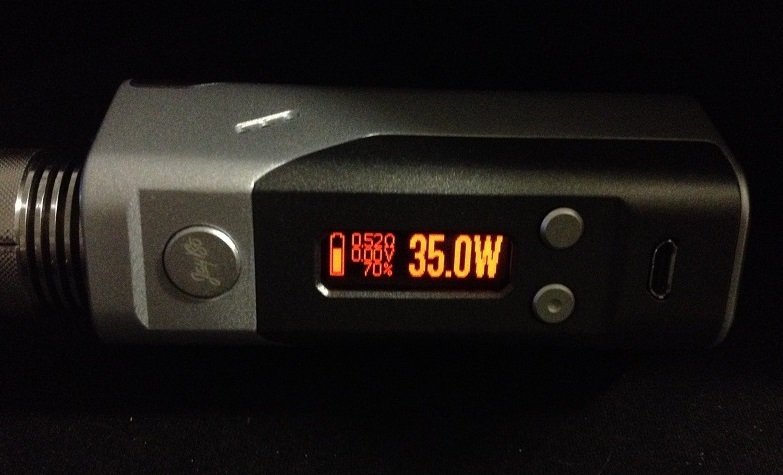 Really glad I found out about this, as the Reuleaux is my favourite DNA200 out of the 4. Prolonging it's life is a priority, as I like it so much . Just done mine in under ten min just be careful pulling the screen off make sure your mod is warm and shouldn't take long to do. Sorry if this is already "old news" - but I thought I'd share some good news anyway. The ribbon is not being compressed at all when I press the firing button - the ribbon seems to be shorter than on the pictures I've seen - stopping just short of the firing button. I was very sceptical so I spend at least 10-15 minutes with various lighting sources checking. Either it's been fixed or mine was assembled differently. Board was programmed on November 7th. Anyone else with the same observation? I'm very happy - I was very close to ordering a backup DNA200 screen just to be safe. No need anymore I guess. I don't work for Wismec or have any financial interest in them. In fact I'm somewhat underwhelmed by the device - i much prefer my SDNA200 (... I don't work for SMY either). Thanks for the details and pics on the repair for the Wismec. I hope I got it right. Curving the ribbon under the board felt a bit nervy. LOL. Easy enough though. Really appreciate the detailed information. Good job. Anyone tried to send an email to Wismec? I've done one yesterday, since my mod's chip was programmed on 7th December yet the firing button issue still exists. Do they make these in different factories or what? Okay, so I did this today, and while it was scary, it was quite fulfilling. Took me roughly 2 minutes to do, but the seating of the screen wasn't at par as to what was, hence I redid the whole thing thrice and now the button doesn't hit the screen cable! Thanks to everyone who shared their inputs and how-to's. To be honest I wanted to try this a couple of days back, but it seems that a little alcohol prodding to steel the nerves was required! Well hi guys I am having similar problem with my lost vape triade my worry is that the screen already went black do you think this ribbon shift will help it come back to live? Why risk taking your screen out and putting more folds in it , as I said earlier just put a bit of plastic between the cable and the button, I just got a Reuleuax today I did some pics. I gently worked the plastic in between the wire and the switch from the direction of the arrow then trimmed the excess off.